The Amherst Railway Society "Clinics Department" continues to grow every year. For the 2019 Show, there are many changes, so please read on! Free parking at the hotel if you are staying at the hotel! Register now and join us for a great time of fun and learning. We’re looking forward to seeing you in Springfield! Fill in all of the information, most importantly, the credit card information. Repeat the process for each person attending. Advanced Tickets for the 2019 Clinics is now closed. to see if there are any seats left. The 2019 program continues our long tradition of offering timely clinics designed to improve each student’s modeling skills. Building on this tradition, we are introducing each of our students to the latest developments in model railroading. Every participant is free to choose any of our clinic offerings for each of our time slots. An independent work area will be set up for any student who wishing to continue working on a project after their lesson. Our N-Scale offering has been expanded. Almost all of our Hands-on clinics will feature both N-Scale and HO-Scale options. We are really excited to bring T-Trak to our students. In recent months, T-Trak has generated interest with a record setting display at the NMRA National Convention. We want to bring the whole T-Trak experience our students. We have a limited number of T-Trak modules that we will provide to our N-Scale modelers on a first come first served basis. We have built 20 Standard Single T-Trak modules and 20 Single T-Trak modules that were modified to incorporate a water feature. These modules are the blank canvas that will showcase your newly found skills. The classes will direct the student towards the completion of the major scenery elements on the T-Trak modules. Friday will focus on polishing the modules and adding details, weathering and preparing the modules for the show on Saturday. To complete the T-Trak experience, participants can bring their modules to the show not only to display their handiwork, but to become part of an actual organic T-Trak display with running trains. The schedule is based on the best information available at the time of its creation. Please note that the actual schedule is subject to change based on instructor availability. You will experience all the new Chooch products, how to use them and see where you can use them on your layout. There will be free samples throughout Mike's presentation. You will get a firsthand look at all the new products Chooch is creating to make your modeling efforts easier and more detailed. Mike will demonstrate stone walls, cobblestone streets, tunnel liners, sidewalks, shingled roofing and brick walls. T-Trak was introduced in 2001 and has quietly became one of the fastest growing modular standards. In N-Scale, the modules are slightly larger than a square foot. There are no legs required, the modules are placed on a table top. Transportation of T-Trak modules are a breeze, as they can easily fit into the back seat of the family car and hand carried to the train show. Students wishing to participate in the T-Trak curriculum will be provided with their own T-Trak module on a first come first served basis. Only 40 modules will be available. The T-Trak module will become the blank canvas that will be a masterpiece in two days’ time. In order to experience the full T-Trak phenemon, all module builders will be invited to display their module at the Train Show on Saturday and Sunday. Learn to airbrush your scenery, backdrops, locomotives and rolling stock, track and structures for a natural weathered look. This highly informative “Hands-On” workshop teaches you basic and weathering airbrush techniques, what air sources to use, and what materials are compatible. The different types of paint available today and their uses, what working surfaces are suitable, their preparation, and the simple maintenance procedures that are required. Attendees will learn basic airbrush maintenance and techniques, practice simple control exercises, and practice weathering with an HO scale freight car. Attendees may bring their own piece of rolling stock if they wish, or one will be provided at no charge. Limited to the first 20 people. This Clinic will be offered later in the day and again on Friday. Learn to airbrush your scenery, backdrops, locomotives and rolling stock, track and structures for a natural weathered look. This highly informative “Hands-On” workshop teaches you basic and weathering airbrush techniques, what air sources to use, and what materials are compatible. The different types of paint available today and their uses, what working surfaces are suitable, their preparation, and the simple maintenance procedures that are required. Attendees will learn basic airbrush maintenance and techniques, practice simple control exercises, and practice weathering with an HO scale freight car. Attendees may bring their own piece of rolling stock if they wish, or one will be provided at no charge. Limited to the first 20 people. This Clinic will be offered again on Friday. This clinic is the first brush stroke for out T-Trak modelers. This clinic discusses layout planning, creating subtle land forms out of foam and the effective use of ground cover. All students are welcomed, space permitting. Note: the independent work space will be utilized to accommodate as many students as possible. SketchUP is the defacto standard program for drawing three dimensional objects that are destined to be sent to a 3D printer or 3D printing service like Shapeways. Install the free SketchUP software on your computer and bring it along to make this a hands on experience. The DPM modular building system offers the modeler an opportunity to produce impressive non-descript industrial buildings and flats for urban and industrial scenes. This clinic will discuss planning the use of planning tools, paper mocking up buildings and the construction of a small brick building in HO or N scale. This clinic will is all about modeling a water scene. From painting the water bed, to adding details that stick out above the water to the application of the water product itself. This clinic is paired with the Bait Shed build that follows at 2:30. These two clinics are open for our T-Trak and HO modelers. Miles discusses his techniques for using his printer to create signs, billboards, handbills and even building walls and interiors. Modern computers allow us to clean up less than perfect source images and printers allow printouts in any scale. Install Photoshop elements on your computer and bring it along for a hands-on experience. The Blue Rail Iron Horse board marries Blue Tooth input to a standard four function decoder outputs. It can be mounted inside a locomotive like a traditional decoder – however it offers a host of “out of the box” opportunities for train control. This hands-on clinic will guide the participants through the construction of a bait shed that will be incorporated into the water scene created at the 1:00 clinic. This bait shed is a unique laser cut kit that was created exclusively for this clinic and available for both HO and T-Trak modelers. This clinic explores the use of Card Models in model railroad scenery. The discussion will explain the math of resizing of card model PDF files, if they were not drawn in your desired scale. The use of bracing for structural integrity is examined. Some card models are photorealistic, but others are a little more cartoonish. The clinic explores the idea of upgrading a card model with windows casting or a complete reskinning with wood or plastic siding. This is a hands-on clinic, the participants will build a small stone or brick shed model from Scalescenes.com. Are you new to DCC? Are you finally getting around to building your own layout? Or are you just trying to get the most out of DCC. Barry will discuss various wiring strategies to prepare you for a successful, easy to troubleshoot, DCC track installation. There are plenty of commercially made “beautiful trees” for select spots on your layout. But what about all the hundreds and hundreds of background trees you need? You want them to be easy to make, quick to build, and cheap. That’s what this clinic is about. We’ll build several different kinds that meet this criteria--and they look good too! This is a hands-on clinic. Mike Dettinger - Model Railroader University - It Figures – making your own figures. The figure clinic starts with the students creating their own armature. Once posed, the armature is skinned with Kneedatite, AKA Green Stuff. Note: this is not Squadron Green Putty. Basic sculpting and single use molding options are also explored. Painting and Weathering Freight Cars with the New Chooch Acrylics. Bring your own yellow or orange-sided reefer and learn how to paint and weather your own car. This is a hands-on clinic; brushes and paints will be provided. Learn to airbrush your scenery, backdrops, locomotives and rolling stock, track and structures for a natural weathered look. This highly informative “Hands-On” workshop teaches you basic and weathering airbrush techniques, what air sources to use, and what materials are compatible. The different types of paint available today and their uses, what working surfaces are suitable, their preparation, and the simple maintenance procedures that are required. Attendees will learn basic airbrush maintenance and techniques, practice simple control exercises, and practice weathering with an HO scale freight car. Attendees may bring their own piece of rolling stock if they wish, or one will be provided at no charge. Limited to the first 20 people. Inspired by a Model Railroader article from the 1950s, this clinic examines an inexpensive technique for modeling a log cabin in both HO and N scale. Different carving strategies are used based on the scale being modeled. Narrow Gauge Railroading dramatically captures the railroader’s epic battle against both Mother Nature and the company accountants. Narrow Gauge railroaders required ingenuity and a little luck to move precious lumber and minerals to market. The made the most with the very least. Narrow Gauge railroading is a celebration of recycling and out of the box thinking. This clinic looks at the appeal of Narrow Gauge modeling and some of the products to get you started. Brian and Jill Bollinger - BEST Trains - Using Detail Parts to set the scene. Our layouts tell a story, but great stories have enough detail to be interesting, but do not get bogged down in minutia. Brian and Jill will share some ideas that further your layout’s story without causing distraction. They will look at some detail parts on the market and discuss the techniques required to create a realistic scene. Among the various HO scale vehicle kits on the market, the Jordan Highway Miniatures are some of the most popular. These finely detailed kits can also be difficult to assemble. There are various types of HO vehicle kits in the market place. Vehicle kits come in various forms, plastic, resin, white metal and brass. A discussion of the various kits plus examples and techniques that produce excellent results in building and finishing. This clinic explores the basics of DCC, sound decoders and the Tsunami2. Come see the new product features and unlock the potential of the Tsunami decoders. This clinic will introduce the participants to graffiti. Love it or hate it, graffiti is as much a part of the modern railroad scene as repainted report marks and weathering. This clinic will examine some of the techniques to tag or otherwise dress you your rolling stock. We will look at decals and hand painted creations. This Clinic will cover the preparation, research, paints, masking, decaling, sealing and final detail and assembly of models. All types of structures will be discussed, including plastic kits, Wood & craftsman kits, metal kits and scratchbuilt structures. Also included will be techniques for metal siding/ roofing, aging & weathering walls and foundations. This clinic will explore the differences between plastic model kits, laser cut kits, and craftsman kits. Mike will contrast the techniques used in building these kits, the materials found inside the boxes, weathering and customizing techniques and getting to a finished scene. This clinic is geared for our T-Trak participants, Doug will discuss and demonstrate the techniques required to turn the waterfront scenery elements installed on the T-Trak module into a cohesive scene. Doug is a weathering expert. His clinic explores all aspects of weathering – from a light dusting to the 3 Rs – ‘Recked, Rusted and Rotted. Matt will introduce our students to the ESU/Loksound product line. Matt will demonstrate the usage, the programing and new features of the sound decoder line. The ESU command station will also be demonstrated. And Matt has an exclusive product announcement that will be shared first with our students. This is a two for one clinic. The opening segment of this clinic will discuss the tips and techniques to promote reliable running model rolling stock. The correct use of the NMRA wheel gauge and the couple height gauge will be demonstrated. The second segment of the clinic describes the use of chalks and powders to give our rolling stock a light weathering. 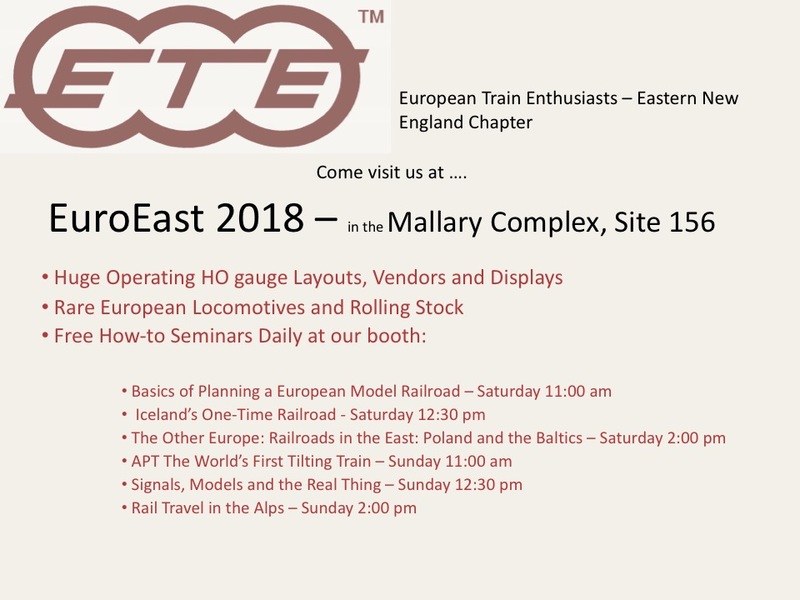 Before the T-Trak modules go to the show, Jill leads an all star cast of model railroaders that will offer last minute tips and suggestions for our student’s T-Trak modules. The instructors would love to see each student leave with the best module possible and will do their best to make this a reality. Fill in all of the information, most importantly, the credit card information. Repeat the process for each registrant. That's it....you will be contacted by us so that you know what tools you should bring with you! For the pre-show clinics, the tool list will be fairly small and common items. I would imagine that most modelers have this already in their travel bag. I would ask, if you are driving to the show, please bring some extra items to share with our participants who are flying – as some items on this list will not be allowed on an airplane. The act of sharing a tool may even lead to a lifelong friendship. Razor Saw, wire brush or a file card. A selection of Craft Paints (cement color, a dark brown, silver, rust, blues, greens or yellows appropriate for water, a trim color for windows, dark gray, and any other color that you want. Optionally, you may want to bring a thumb drive for electronic copies of the slide presentations and handouts from our presenters who have made them available for distribution. 10:00 AM "Build a Woodland Scenics/DPM Kit"
1:30 PM "Learn to Make Trees"
3:00 PM "Build a Scenery Module"
10:30 AM "Build a Woodland Scenics/DPM Kit"
3:00 PM ​"Build a Scenery Module"
Please note that all clinics are hands-on and participants will have the opportunity to be directly involved if they wish. All clinics are held in the South Section of the MALLARY COMPLEX. Come early to get a “hands on” seat in our clinic area!!! Clinics offered by Manufacturers, exhibitors and experts – Open to all levels - please note that some may require pre-registration. Lighting brings scenery alive! However, planning and execution place significant demands on the modeler. Advances in lighting will be covered, leading to a description and demonstration of a brand new system (from Dwarvin Enterprises) that uses a single light source distributed through fiber optic cables into buildings, street lamps, cars, trees, whatever can be imagined. Basically, if you can use a drill you can install this lighting. Put on your creative hat and participate in this clinic, sharing ideas with other modelers. Why add battery r/c control? Because it adds more fun time to running your trains. Imagine no more track cleaning, stalls/shorts on switches or complex reverse loop wiring. JMRI is FREE computer software for enhancing performance and enjoyment of many aspects of our model railroading hobby. This clinic will introduce the many aspects of the JMRI software and briefly describe its capabilities. DecoderPro makes it very easy to program DCC decoders and get the most out of these devices. PanelPro focuses on the layout, including panels (virtual or physical) and signaling. Other sections that address Operations, wireless control and other new developments will also be covered. Hands on demos will be available at the JMRI/LCC help desk in the Stroh Building. Hot Wire Foam Factory is a manufacturer of Styrofoam cutting, sculpting and engraving tools as well as foam adhesives and coatings. They will be located in BLC at tables 40 B&C.